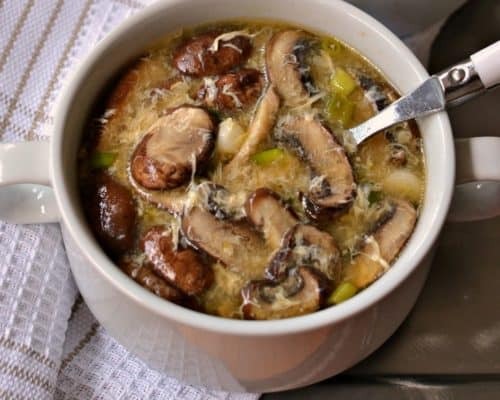 HOT AND SOUR SOUP IS A UNIQUE CHINESE DELIGHT BRINGING TOGETHER MUSHROOMS AND TOFU IN AN EASY TO PREPARE MOUTHWATERING BROTH THAT IS BOTH SPICY AND TART. 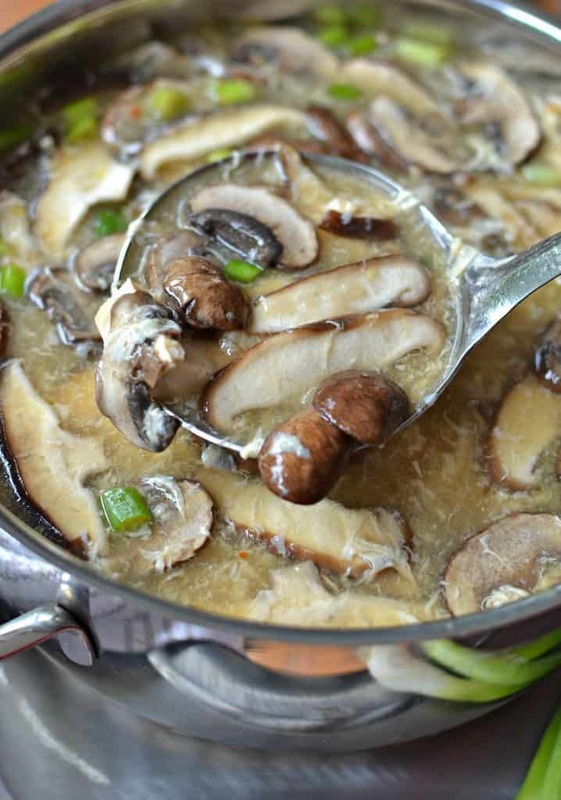 If you have tried Hot and Sour Soup then you know that is quite the culinary delight. It is difficult at best to explain to someone who has never tried it how all these different flavors can co-mingle so well. I am sure that just like my family many of you have tried hot sour soup at your favorite Chinese restaurant. Well it is one my absolute favorite soups so it is no wonder that I would create my own recipe for this treasure. Now you can cook this delight right in the comforts of your own kitchen with ingredients that you are in control off and you can balance this gem to your taste. WHAT IS HOT AND SOUR SOUP? I thought you would never ask. 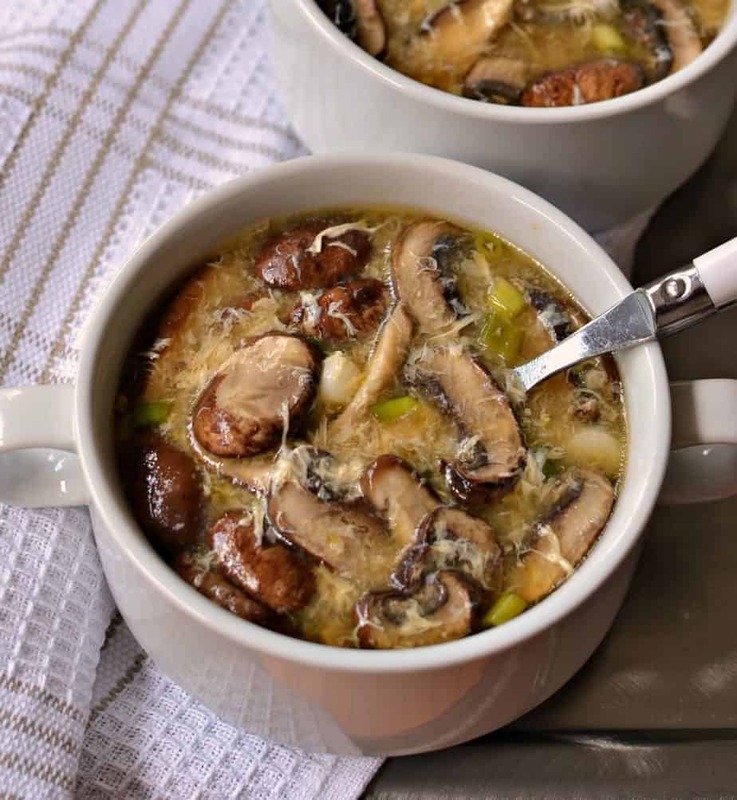 This Chinese soup is a chicken broth based soup of mushrooms, tofu, eggs and green onions. Chili paste is added to the broth giving it a little heat (albeit pretty mild) and rice vinegar is added giving it just a little bit of kick or sour. Hence the name was formed chili paste for hot and rice vinegar for sour. Perhaps not the best name for this soup but nevertheless absolutely delicious. If you have never made hot sour soup than you really must give this a whirl. Life is short and new tastes and experiences can be refreshing like a cool fall breeze on a hot summer day. HOW TO MAKE HOT AND SOUR SOUP. This easy delicacy can be fully cooked in less than 30 minutes. Simply saute the garlic and ginger for less than one minute. Add the broth, rice vinegar, soy sauce, chili paste and mushrooms. Simmer for 6-8 minutes. Whisk together a little bit of chicken broth and cornstarch. Stir the cornstarch into the simmering soup and continue stirring and cooking for 1-2 minutes. Beat eggs and slowly drizzle into soup stirring slowly as you go. Stir in the tofu, green onions and sesame oil. Serve immediately garnished with extra green onions. It is just that easy. You can adjust this soup to your liking. As you can see I really love mushrooms so my pot is a little heavy with the shrooms!! Upon your final mixing of the soup with the tofu, green onions and sesame oil you can add a little more rice vinegar if you want it more tart or a little more chili paste if you want a little more heat. Maybe you absolutely don’t like tofu than substitute cooked ground pork. That is the best part of cooking. Make it all about you and what you like. My late Mother used to say that we would be in trouble if we all liked the same thing. 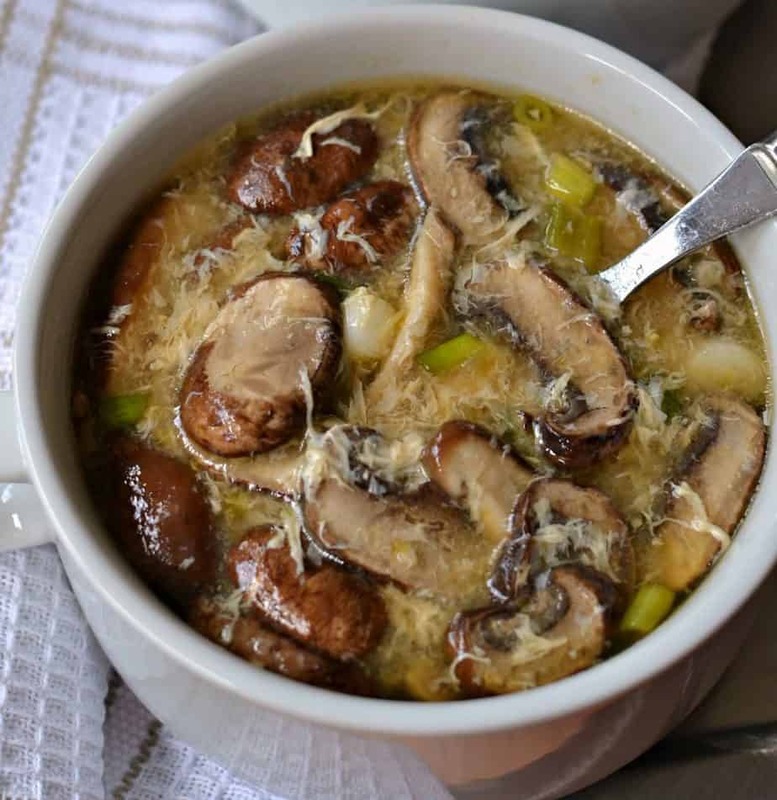 I hope that you are curious enough to give this amazing Hot and Sour Soup a try. It really is delectable and much better than your neighborhood Chinese restaurant. Remember you are in control of the ingredients and the final taste. MORE SOUP RECIPES YOU WILL LOVE!! In large stockpot or dutch oven over medium low add oil. When hot cook garlic and ginger for 60 seconds. Stir in chicken broth, rice vinegar, soy sauce, sambal oelek and mushrooms. Simmer for 6-8 minutes. Mix cornstarch with reserved chicken broth. Whisk into soup and continue cooking and stirring until slightly thickened; approximately 2 minutes. Slowly drizzle in beaten eggs while stirring. Stir in tofu, green onions and sesame oil. Garnish with remaining green onions and serve.